Presenting at the 10th Jeju Forum for Peace and Prosperity in May, JICA-RI Deputy Director Naohiro Kitano told international dignitaries it is important for the three major Asian ODA donors Japan, Korea and China to communicate and enhance evidence-based policy dialogue. 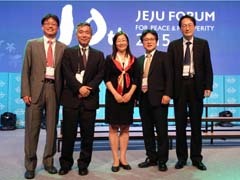 The forum, held May 20 to 22, 2015 on Jejudo island, South Korea, is a multinational dialogue to promote peace and prosperity in East Asia. Participants held a wide-ranging discussion. They included Gerhard Fritz Kurt Schröder, former chancellor of Germany; Susilo Bambang Yudhoyono, former president of Indonesia; Yasuo Fukuda, former prime minister of Japan; John Winston Howard, former prime minister of Australia; Joe Clark, former prime minister of Canada; and Lee Shaolin, chairman of the Chinese People's Foreign Friendship Association. Kitano served as a panelist in a session entitled "Towards A Transformative Partnership: A New Agenda for China, Japan and Korea in the Post-2015 Development Framework" sponsored by the Korean Association of International Development and Cooperation (KAIDEC) and the Korea International Cooperation Agency (KOICA). In a presentation entitled "Asian providers of aid at a transitional stage: Japan, South Korea and China," Kitano overviewed the contribution of three countries to international development and talked about prospects of partnership in the region. He first touched on how South Korea, as a new member of the OECD Development Assistance Committee, is proactively contributing to the Post 2015 Development Agenda by helping attract international conferences and international organizations to Korea. He discussed China's estimated foreign aid and the fact that it is working to create new international frameworks such as with the Asian Infrastructure Investment Bank. Switching topics to Japan, he said the guiding principle of its approach is human security, and explained through examples how Japan is focusing on disaster risk reduction and universal health coverage in particular. He also explained that Japanese, Korean and Chinese assistance projects in Asia, Africa and elsewhere are in close proximity to one another, giving the examples of the Hanoi Metro and agricultural development projects in Cameroon. Finally, he emphasized that dialogue among the three countries using such platforms as the Asian Development Forum will become increasingly important. "Participating in the session organized by KAIDEC and KOICA helped promote interaction between JICA-RI and Korean researchers. There will be plenty of opportunity to deepen this interaction in the future," Kitano said.